I love jeans, but do jeans love me? If I’m honest, no. 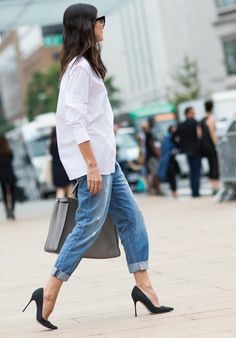 I’m a typical pear shape and jeans can look ok but I should really be wearing a loose cut with slim fit tops tucked in and for some reason I love a cigarette (straight, cropped at ankle) French style for slim pins! Side view ok, bottom acceptable but front view thighs, not great. Jeans are a love/hate issue for most women. 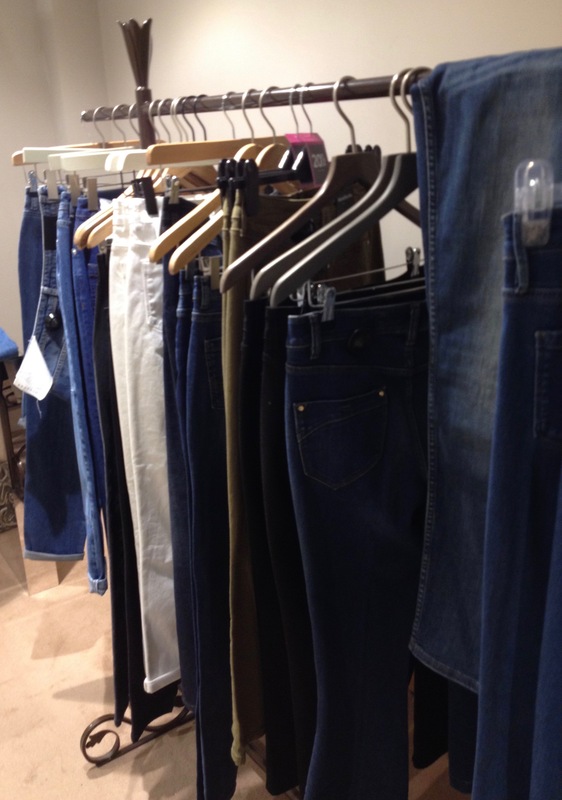 I set up my Jeans Workshops so that we can really work out what shapes work, and basically you just have to try on eight to ten pairs to get a good idea. Skinny jeans are beginning to release their grip on fashion as wider, looser styles are seen on celebrities and the high street and eventually we will see wider as the norm again. In fact the slim silhouette with be continuing more with training style leggings, ‘are you going to the gym or not’ look. Power leggings are the buzz word.. more on that soon. What have we learnt so far at the Jeans Workshops? Wear daily footwear. They may well look better worn with a heel but if you generally wear them everyday with a trainer or pump, try them on with comfort in mind. Higher waists are may take a while to get used to but they sure look more flattering and smooth out tummy issues. Ignore the pictures. 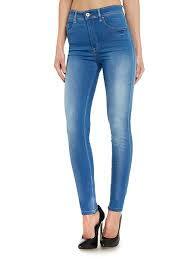 For some reason, every jean shape looks so skinny on-line even if they are a straighter leg. So go with the description not the tiny model. 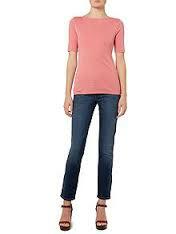 Skinny jeans are still popular, to layer under tunics and the stretchy comfort they offer. 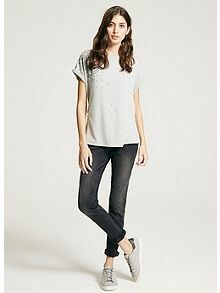 Roll up the hems for a summer cropped look, French style, skinnies become a straighter leg. 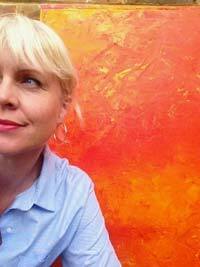 These are the ‘Top Buys’ from the workshops (so far) and most are available in a range of basic shades. 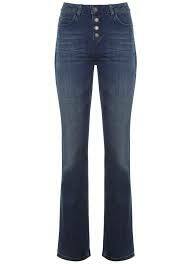 SKINNY curve hugging, all of these sat with higher waistlines. 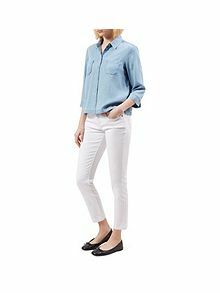 For a really comfortable skinny jean/jegging for layering French Connection Super Skinny, £75 (more colours in sale options from £23) From size 10-14 our ladies loved the easy comfort. 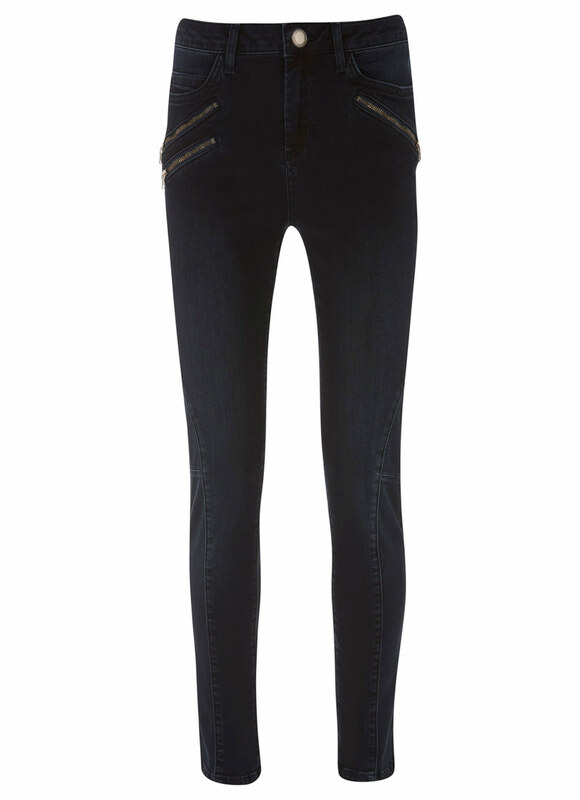 For skinnies with attitude Mint Velvet Phoenix, £69 washed out black, seamed and zip details, looked great on size 10, worn with a semi tailored jersey jacket, t-shirt and block heels. For a skinny with super stretch, higher waist, great quality (they wash well) Salsa Carrie, £95 was a popular choice, particularly for sizes 10 and 12. 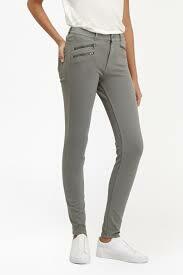 STRAIGHT a slim leg and higher waistlines. 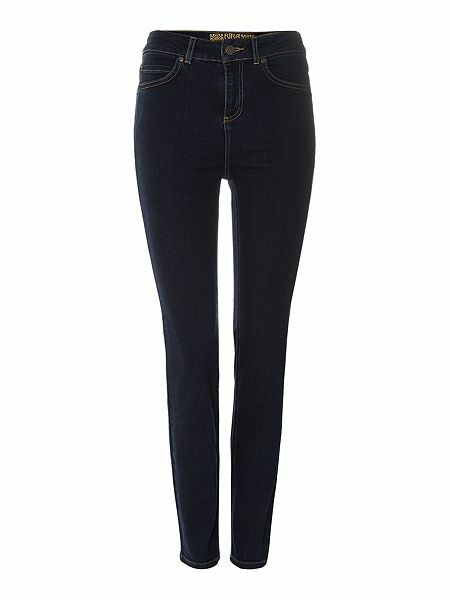 There was high demand for a less skinny leg, higher waist, a simple jean Jean. 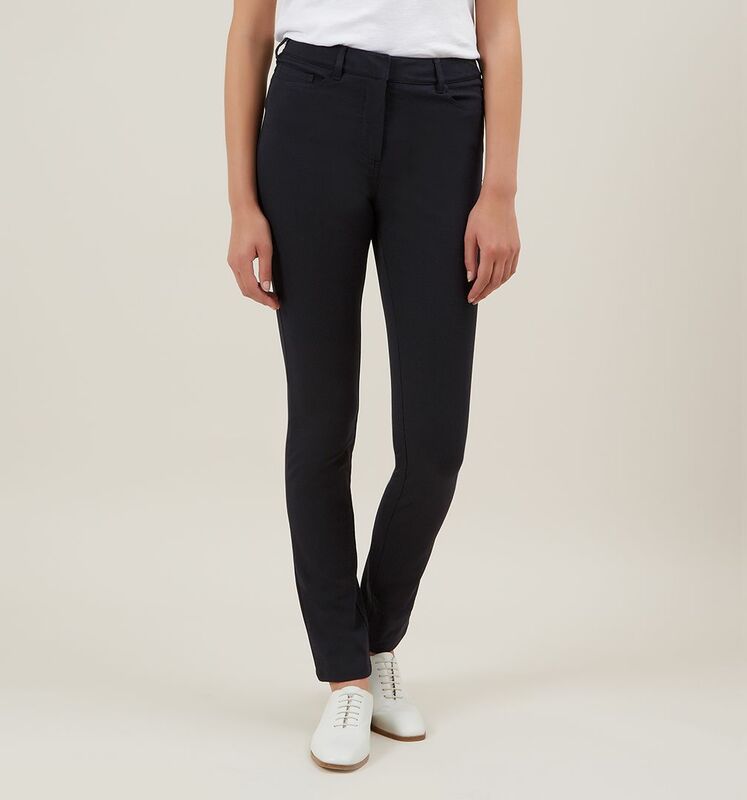 Maybe more of a jean trouser but popular as a great basic, Hobbs Amanda, £85 is on repeat in black and navy too. CROPPED shorter leg, but easy fit. A great fit and shape on our size 14’s, these Hobbs Dickenson, £79 where bought in grey and white. BOYFRIEND in a bit of distress! 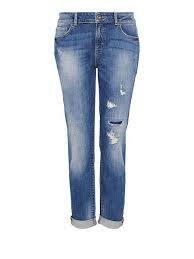 A looser fit, with a few cuts and bruises, Halluber pre-distressesed boyfriend jeans, £89, look great with girlie tops for balance and heels for evening. 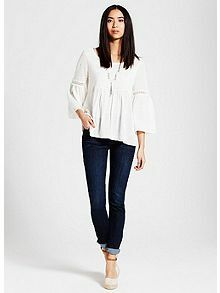 FLARED get used to seeing a wider leg, great to elongate worn with a wedge, but needs to have cropped or tucked-in tops. How to wear them, as shown on Pinterest. We scratched the surface of the jeans world but one thing is certain, there is no magic fitting advice apart from Try On Many! Whatever the fashion, denim has it’s place in your wardrobe.